Fr. Charles O. Rosensteel had a dream to establish a school. In 1931, he wrote to the bishop, “I have a special fund which I have been saving to build a school at Forest Glen, MD. Please file this in case I may die before I can accomplish the greatest desire of my life.” Growing from his dream, St. John the Evangelist School opened on September 17, 1950, in what was then known as Forest Glen, Maryland. Seven Sisters of the Congregation of the Immaculate Heart of Mary (IHM), from Scranton, Pennsylvania, were the first educators of the children. On September 17, 2000, the school community was proud to celebrate fifty years of academic excellence. St. John the Evangelist School is honored to have three religious of the order still serving its students and families. 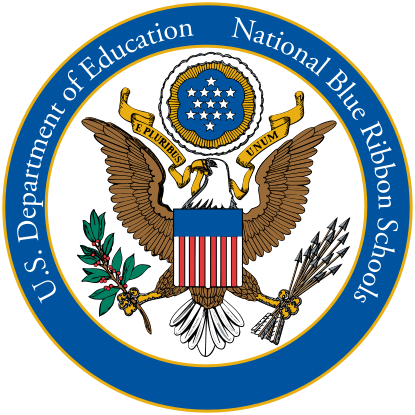 On September 24, 2013, the auditorium exploded with cheers and vigorous waving of blue pompoms as it was announced that St. John the Evangelist had been selected as a U.S. Department of Education National Blue Ribbon School. One of only fifty private schools in the nation to be given this designation in 2013, SJE was also one of only seven Maryland elementary schools, public or private, to win the honor as a “high-performing” school. That means that SJE was ranked among the highest performing schools in reading and math, with its students testing in the top ten percent of all students in the state in those areas. Since the awarding of the Blue Ribbon in 2013, SJE has continued to meet the Blue Ribbon Standards in Reading and Math in all applicable grades. Our scores are well above the national average in these areas on nationally normed standardized tests. The Congregation of the Sisters, Servants of the Immaculate Heart of Mary (IHM) is a community of 489 Catholic women religious whose roots date back to 1845. The IHM founders were visionaries with an acute sensitivity to the urgent needs of their times and an unremitting orientation to life and to the future. Their zeal for mission, generosity of spirit, courage, resourcefulness, and confidence in God's loving providence enabled them to convert dreams to deeds. IMH history since those beginning days is a long and joyful course of hope and vitality, proclaimed through lives of prayer, a communal lifestyle, and works of education, health care, social service, and pastoral and spiritual ministries. Click on Sisters of the IHM for further information. St. John the Evangelist School is a member of the Archdiocese of Washington’s school system and as such is governed by the policies and regulations that are promulgated by the Catholic Schools Office and its Board of Education. Furthermore, we are governed by the policies that are particular to our school using the guidelines of the Policies and Regulations of the Archdiocese. Through the School Advisory Board, our policies are generated and evaluated on a regular basis. At the annual School Advisory Board open policy meeting, parents offer suggestions to our School Advisory Board regarding either established policies or new policies. The faculty’s input is made during the monthly faculty meetings. The administration of the school is conducted through the administrative team of the pastor and principal. St. John the Evangelist School is accredited by the Southern Association of Colleges and Schools, a division of AdvancED. This partnership provides us with a demanding research-based process that incorporates strategic planning and Catholic standards into school accreditation. Accreditation is a rigorous process used to validate that schools in the Archdiocese of Washington uphold their Catholic identity, ensure high academic achievement, provide safe and nurturing learning environments, and work to continuously improve. St. John the Evangelist School’s faculty and parents work in conjunction with the school’s Advisory Board and administration to monitor and coordinate yearly reviews of the goals set during the reaccreditation process. Subcommittees continue to work toward increasing enrollment, improving facilities, increasing outreach, and, most importantly, ensuring the curriculum is rigorous and engaging. All of these strategies and efforts make the vision of a constantly improving St. John the Evangelist School come alive. High School Admissions & Scholarships: St. John the Evangelist students receive scholarships to various high schools in all areas of academics, athletics, music, and speech. More than 98% of St. John the Evangelist graduates who seek admission to Catholic high schools have been accepted into Catholic high schools to continue their education. Band: St. John the Evangelist School’s Advanced Band participates in the Archdiocesan Band Festival each spring. This is an adjudicated event for about 30 bands throughout Montgomery County and Washington, DC. Our band has received a Superior rating (the highest ranking) for the past six years. In the 2007-2008 school year, we received the highest score at the Band Festival. This was repeated in 2017.